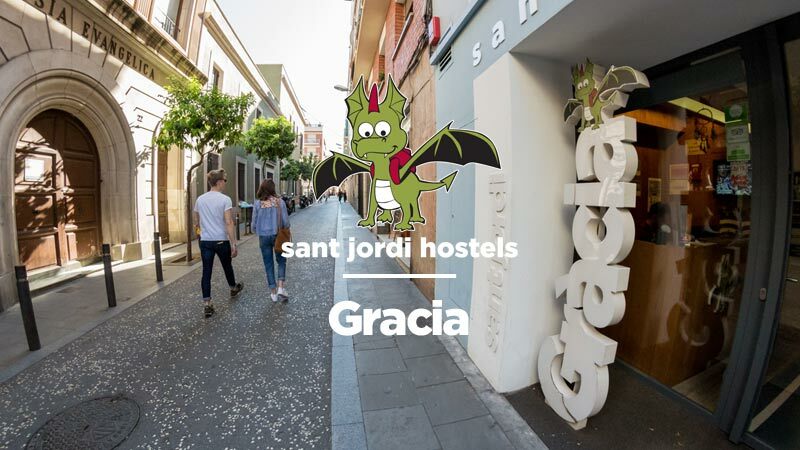 Follow the directions below to find your way to the Gracia hostel by Sant Jordi hostels Barcelona. The nearest metro stations are “Fontana” (lines 3) and “Joanic” (lines 4). Each subway station is about 5 – 10 minutes walking from the hostel. We recommend coming with the metro line L3 (green) using the “Fontana” stop. Coming from EL PRAT AIRPORT (BCN’s main airport): The BCN airport has 2 terminals (Terminal 1 and 2). If you are already in terminal 2 just follow the yellow line in the direction of terminal 2B or the signs for the train/railway (ferrocarril). Coming from Terminal 1 you will need to take the Airport terminal transfer bus and get off at Terminal 2B. Go in the terminal and up the escalators to the right. Always follow the signs for the train/railway (ferrocarril). Go through the tunnel (over the bridge) to the railway terminal. Buy a metro ticket (T-10 is the best deal for travelers). Take the first train (all trains go in the same direction). Get off the train at the Passeig de Gracia stop (B.PG.Gracia). Once at the Passeig de Gracia stop, follow the signs to the exit (actually you will just be switching to the metro/underground). Inside the Passeig de Gracia Metro station, catch the Metro L3 (green) in the direction “Trinitat Nova” and go to the stop “Fontana”. Now follow the directions given BELOW for coming “From Metro Stop Fontana”. Coming from SANTS-ESTACIÓ Train Station: Inside of the train station you will need to find the entrance to the metro. It is at the opposite end of the train station from the McDonalds. Take the metro line 5 (Blue) in the direction of ‘Vall d’ Hebron’ to the stop ‘Diagonal’. When you exit the train at the ‘Diagonal’ stop you will need to transfer to the L3 (green) metro line. With the L3 (green) metro line you need to take the train in direction ‘Trinitat Nova’ until the stop ‘Fontana’. Now follow the directions given below for “Coming From the Metro Stop Fontana”. Coming From BARCELONA NORD BUS STATION: Take the metro – The metro stop is in the small park just next to the bus station and is named ‘Arc de Triomf’. The metro line at the ‘Arc de Triomf’ stop is the L1 (red) metro line. Take the train that goes in the direction ‘Hospital de Bellvitge’ until the stop named ‘Catalunya’. When you exit the train at the ‘Catalunya’ stop you will need to transfer to the L3 (green) metro line. With the L3 (green) metro line you need to take the train in the direction ‘Trinitat Nova’ until the stop ‘Fontana’. Follow directions below for “Coming From metro stop Fontana”. Coming from GIRONA AIRPORT: Take the Barcelona Bus from the airport to Barcelona Nord Bus Station (final destination). Once there, follow the direction above for “Coming from Barcelona Nord Bus Station”. Coming from METRO STOP “FONTANA” – using the L3 (green): When you exit the metro at the ‘Fontana’ stop you will be standing on the street Carrer Gran de Gracia. With your back to the metro station go to your left, down Carrer Gran de Gracia. Continue down Carrer Gran de Gracia for approx. 200 meters (220 yards) until you come to the street Carrer de Ros de Olano (on the left). Turn left on Carrer de Ros de Olano and continue straight for approx. 400 meters (430 yards) and the hostel will be on your left. *note* The street “Carrer de Ros de Olano” changes into “Carrer Terol” after approx. 5 blocks – After crossing the street Carrer del Torrent de l’Olla, the street Carrer de Ros de Olano becomes Carrer Terol.